We are back from an AMAZING vacation. Where we ate WAY TOO MUCH but enjoyed every minute of it. I am learning new little things about myself as I continue this health journey. Bad News: I have been off track for quite some time and I have enjoyed it a little too much over here stuffing my face with cookies and pizza- I have also added some extra fat and gotten out of shape. Good News: I have 3 things that are inspiring me to get back on track. Inspiration # 1- My dad surprised us with a NutriBullet! I am a huge fan of my MagicBullet and this new addition to my family kitchen has really got me excited. I have already tried it out twice and LOVE it. I may be a little obsessed with it- only time will tell. What I love about it is it is different from a juicer where you have to use TONS of veggies and fruit for small amounts of juice because it gets rid of all the pulp. With this you eat the WHOLE veggie or fruit and it doesn't dispose of any parts so you don't lose any nutritional value. This morning I had a spinach, banana, blueberry, pineapple and almond drink. Sounds gross. Looks grosser. Tastes AMAZING. Inspiration #2- I have 3 weddings coming up in the next few months. One of which I am a bridesmaid and will need to look decent for. Professional pictures=huge inspiration. Inspiration #3- Tomorrow is the first of the month. When better to start a full blown Paleo challenge? 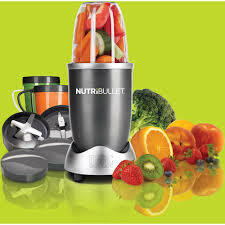 It is a time to cleanse my body of all the crap (with the help of my new friend NutriBullet) and to start fresh!! I am excited. Tonight I am making turkey cabbage so I will have lunch for tomorrow. Impressed with my forethought? All right...so ready...set.. Paleo challenge! 1. Eat Paleo for 30 days with less than 3 cheats (I will be at a wedding so trying to be realistic). 2. Work out at least 4 times a week preferably 5-6 times. 3. Stay away from eating out- Cook 5 times a week (that's a big one but I need to). I love my NutriBullet the end.